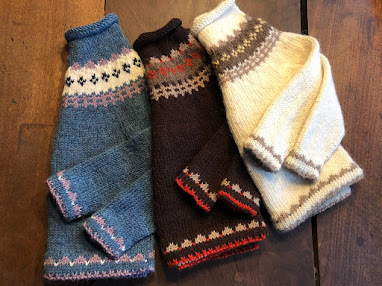 Quince and Co., New England yarn and spinning company, has just published two baby sweater knitting patterns that are "TDF." Designed by Carrie Bostick Hoge, the little contemporary feather and fan jumper, "Camilla Babe", a pullover, is just precious, knit with Q&C "lark" yarn on a size 7 (4.5mm) needle. The size range is generous and includes infant to toddler, 19 (201⁄2, 231⁄4, 243⁄4). Lark is 100% American wool, that means it's from American bred sheep and New England spinning mills. 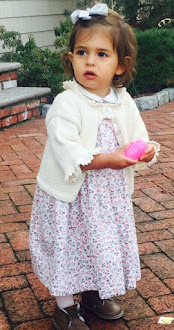 The smallest size of Camilla Babe requires 2 skeins of Lark @$8.00 per skein. You will reel at the rainbow of available colorways, there are 37 in all. You will also find the "Ruffles" baby cardigan at Quince & Co. knit with their yarn "Tern", which is a very special yarn, 75% American wool and 25% silk, with multiple gauges, depending on needle size. 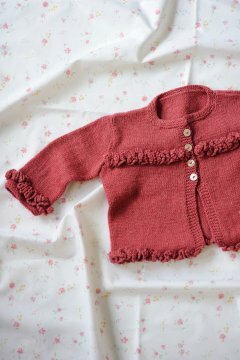 Ruffles, designed by Ann Budd, requires two lengths of circular size 4 ( 3.5mm) needle and 2-4 skeins @$8.75 for sizes 0-3 months to 18 months. Yardage is ample at 221 per skein and the color range, again will surprise you, 12 colors available. 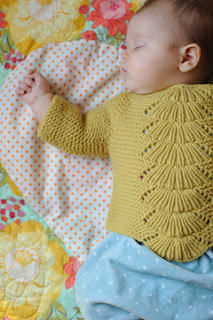 To purchase the baby cardi knitting pattern and the yarn and for more detailed photographs, please visit Quince & Co. For more quick and easy knit and crochet baby sweater patterns, please visit this post.